The hallmark movement of someone impersonating a chicken usually involves jabbing neck motions. Chickens move and see by adjusting their head positions and these intentional and curious actions are entirely normal. There are several pathologies that can cause abnormal neck jerking in poultry. In such cases, the neck jerking is accompanied by other symptoms such as anorexia, weakness and other distressing behaviors. Any abnormal neck jerking by a chicken is an emergency that must be quickly addressed by a veterinarian. Chickens have specialized vision capabilities allowing them to see more colors than people. They, as other birds, can see into the ultraviolet spectrum. They also use their eyes independently, which is why they "jerk" their heads to see things. Chickens move their heads to get objects into focus and to condense an area of binocular vision, while humans move just their eyes. 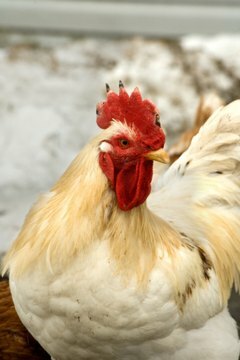 Chickens may exhibit head jerking movements if they have a crop impaction or a foreign object in the crop. The bird will be seen acting in a preoccupied manner, be reluctant to feed and may have an enlarged crop. Sudden choking and gaping movements of the head or exaggerated jerking actions with an outstretched neck, are employed in an attempt to clear the throat or crop. A parasite called the gapeworm presents with similar behaviors. In both impaction and parasite cases, the bird may gasp and jerk or shake its head trying to expel the irritation. Gapeworms are differentiated by the presence of tiny red worms in the mouth or throat of the bird. A vet needs be consulted in both cases for treatment. Star gazing, limpness or twisting and jerking of the neck can be caused from vitamin deficiencies, particularly vitamin E or selenium. Though rare in poultry fed proper commercial or prepared diets, nutritional issues can cause such symptoms. Some breeds, such as silkies, need higher levels of vitamin E which can be found in green leafy vegetables and by access to grazing. If this has been diagnosed by a veterinarian, vitamin supplements will likely be administered and prescribed. Injured birds may exhibit neurological symptoms like head twisting or jerking movements, particularly if there is a head injury. Diseases also cause the head jerking movements. Some serious diseases such as Mareks, EEE, Pasteurella, exotic Newcastle disease, or fowl cholera present torticollis (head and neck twisting). Less deadly disorders, such as an ear infection, may also cause neck jerking or twisting. A veterinarian must assist in all of these cases.